Cutting true diamonds is almost as easy as cutting squares. Print this page and refer to it any time you need help. Please note: Some designers' patterns will substitute parallelograms for true diamonds (all 4 sides are equal.) 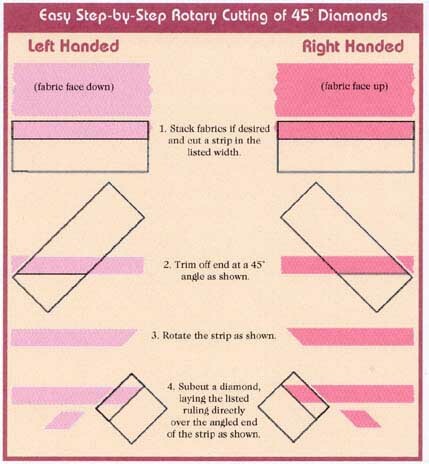 These instructions are guaranteed to work for 45-degree diamonds in my patterns. This page is derived from a lesson in The Creative Pattern Book.